Productive, resilient and easy to grow, green beans belong on every vegetable gardener’s planting list. There are dozens of available varieties and many ways to grow beans, but here I want to cut to the chase and concentrate on growing gourmet green beans that are better than what you can buy. I’ve grown dozens of beans in decades of gardening, and at this point I confess to a certain snobbishness regarding bean varieties. I want crisp, stringless green beans that are so sweet and flavourful that they beg to be eaten raw, but end up in a braising pan, freezer bag or pickling jar. Combining full flavour with tender texture, the culinary stars of the green bean world are filet beans or haricot verts, also called French beans. The slender, rounded pods in may be green, yellow or purple, depending on variety. Exemplary varieties include ‘Maxibel’ bush and ‘Emerite’ pole. Last year I grew petite, purple-podded ‘Velour’, which overcame bad weather and made an excellent crop for the table and the freezer. Like other purple-podded snap beans, the purple colour of ‘Velour’ changes to green when the beans are blanched or cooked. But it takes a lot of delicate French filet beans to fill a basket, so most of my plantings are of high-quality regular green beans, which bear bigger pods that are long, straight, and stringless. I love the ‘Amethyst’ variety because the purple flowers are so pretty, but my favorite strategy is to grow a tri-color blend of varieties that bear green, purple and yellow pods. Many seed companies offer mixed packets, and you can separate the seeds by colour if you want the varieties in different rows. Most green snap beans have white seeds, the seeds of purple beans are tan, and most (but not all) yellow snap beans have black seeds. Finally, you will need to choose between dwarf and vining growth habit. There is no question that long-vined climbing beans produce more food per square foot, and it’s fun watch the vigorous vines scramble over a hand-made teepee or trellis. Dwarf beans, on the other hand, grow quickly and vacate their space in time to grow autumn vegetables in the same spot. I like to make multiple small sowings of different dwarf beans so there are always young plants coming along, each with their special talents. A bean gardener must take precautions to prevent boredom. Traditionally, beans are direct-seeded after the soil warms in late spring, but you also can start seeds in small containers and set them out in prepared beds after two weeks. Bean seeds germinate very quickly, with seedlings up within a few days no matter how you sow them. Don’t rush to thin direct-sown seedlings, because cutworms may claim a few casualties. Wood toothpicks inserted into the soil alongside bean seedlings can stop cutworm damage. When grown in a fertile, sunny spot, beans make rapid growth and quickly dominate their space, which makes them easy to keep weeded. Plants often start blossoming after only six weeks or so, and fast-maturing dwarf varieties mature in less than 60 days. Gourmet green beans are too brittle for mechanical picking or rough shipping, the main reason why they are seldom seen in stores. Plan to pick your beans every other day once they start producing, and use two hands to avoid mangling the plants. I pickle some of my beans, but most of them are frozen for later use in casseroles. 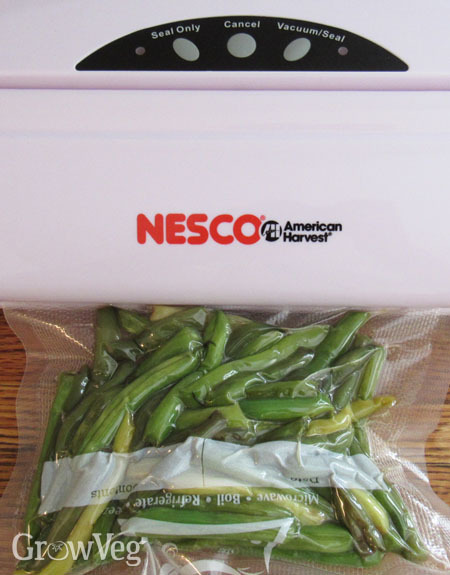 A few years ago I started using an inexpensive vacuum sealer for frozen beans, which eliminated issues with freezer burn. Beans that are blanched, cooled and stored in sealed bags taste garden-fresh when served in December, assuming they last that long. Last summer I grumbled about having to pick, blanch and freeze green beans every time I turned around, but midway through winter we ran out of beans, giving me something new to grumble about. Now that bean season is back, I can’t wait to grow a fresh supply of gourmet green beans.